As Art of Glass is now open at National Museums Scotland, both Bryony Windsor from the National Centre for Craft & Design (NCCD) and myself can now reflect on the journey we embarked upon over two years ago. Our research and development has taken us across the country to meet with curators, specialists and collectors within the field of glass to discuss those artists who are challenging its perception as merely a material for functional objects and are looking to re-evaluate our understanding of the role of glass as an artistic medium. Some of the first artists we chose to visit are based here in Scotland and are creating truly diverse works of art. 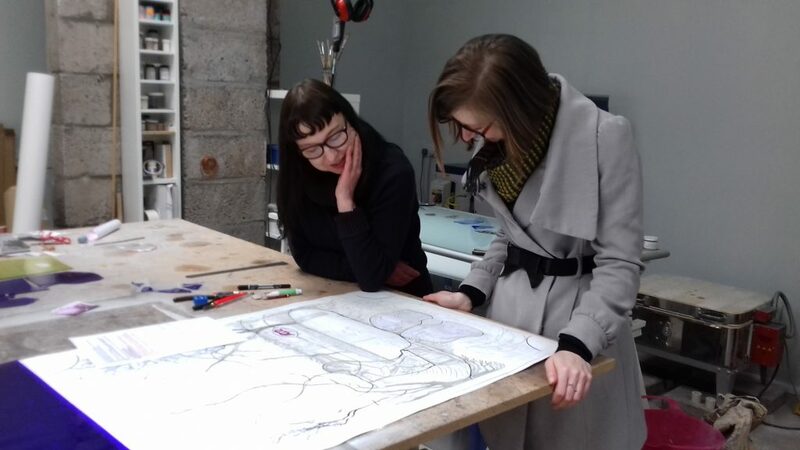 Pinkie Maclure explaining her latest commission to Bryony Windsor, Head of Exhibitions, NCCD, at her studio in Perthshire, 2017. © Sarah Rothwell. Artist Pinkie Maclure, who is based in rural Perthshire, creates exquisite stained-glass artworks that explore contemporary themes on subjects that range from politics and society to the environmental impact we have on the planet. During our research, we came across Pinkie’s work within the exhibition Radical Craft, a Craftspace touring exhibition which celebrated those considered to be ‘Outsider’ or non-mainstream artists. She was also championed by Julia Stephenson, the Head of Arts at National Glass Centre, during our peer reviews. So we were both very keen to meet her, as we felt that she was exploring the art of stained glass in a radically different way. In early spring 2017, we travelled up to Pinkie’s home studio that she shares with her partner to discuss her influences and techniques. 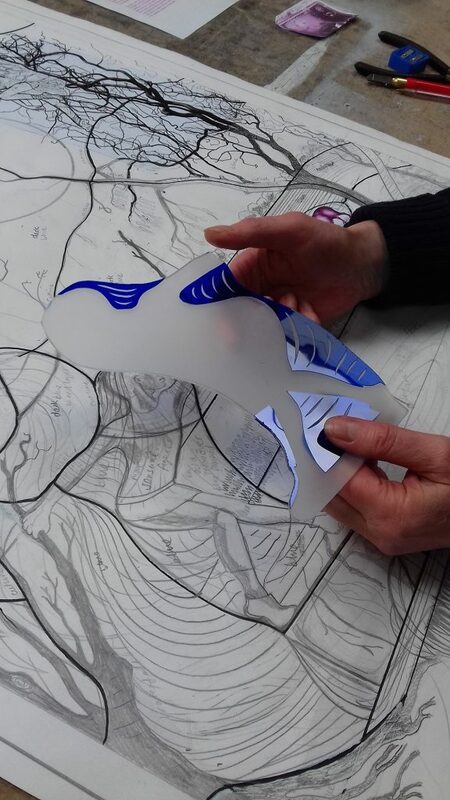 Pinkie highlighting the process where she removes the layer of coloured glass from a specially cut piece of flashed glass to leave the design or details she requires. © Sarah Rothwell. Pinkie came to stained glass initially out of economic necessity, helping her partner restore and conserve historic stained glass. However, she soon tired of the lack of artistic application and started creating her own work. She was inspired by her forbearers who used stained glass to convey allegorical themes within religious and high-profile buildings, to create work that would explore contemporary narratives. Her subjects have ranged from man’s impact on the natural environment to the economic crisis, and our dependency upon social media and the chaos it can cause. We wanted to include Pinkie in the exhibition as she is an exception within the UK, in regard to stained glass; an artist who is passionate not only about her art but the subject she conveys. Her work is both captivating and thought-provoking, illuminating a traditional glass craft in an exciting and dynamic manner. A young glass artist I have been championing since I first met him in 2015, is the Edinburgh-based Harry Morgan. His work is a wonderful exploration of the possibilities of glass and our own perceptions of its vulnerabilities and fragility. 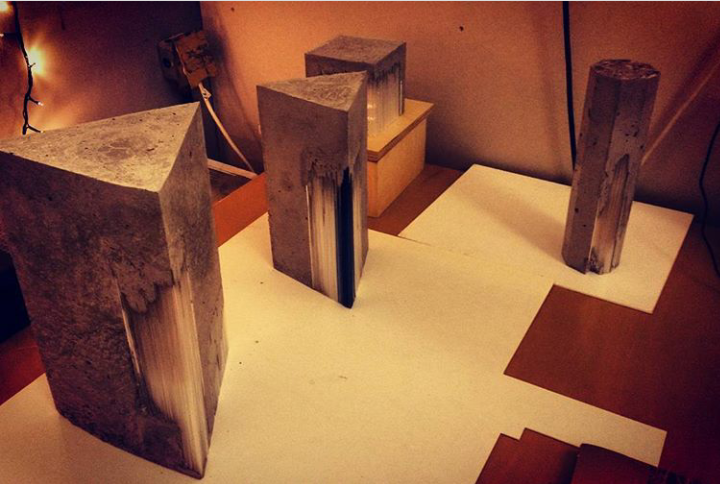 His Brutalist-inspired works have grown from the table top pieces I first encountered, to large-scale monoliths. By juxtaposing glass against concrete Harry is disturbing our understanding of the medium. Originally from Manchester, Harry gained a 1st Class BA (Hons) degree in Glass from Edinburgh College of Art in 2014. Since graduating, he has exhibited at the 2015 British Glass Biennale in Stourbridge, where he was awarded the London Glassblowing Award for Emerging Talent. He was also the recipient of a Graduate Craft Award at the 2016 Scottish Craft Awards. His work has already been exhibited widely throughout the UK and internationally, and is held in the permanent collection of the European Museum of Modern Glass in Coburg, Germany and recently he represented the UK at the European Glass Context in Borholm, Denmark. Only last year he had his first solo show at The Scottish Gallery here in Edinburgh. Harry was drawn to study at Edinburgh due to the interdisciplinary course that is run by ECA, allowing students not only to define their craft skills but explore their artistic and creative possibilities. Since then he has made Edinburgh his home and has a studio based in Leith. Harry Morgan installing his piece Dichotomy I, 2017 & Dichotomy II, 2018 in the Art of Glass exhibition. 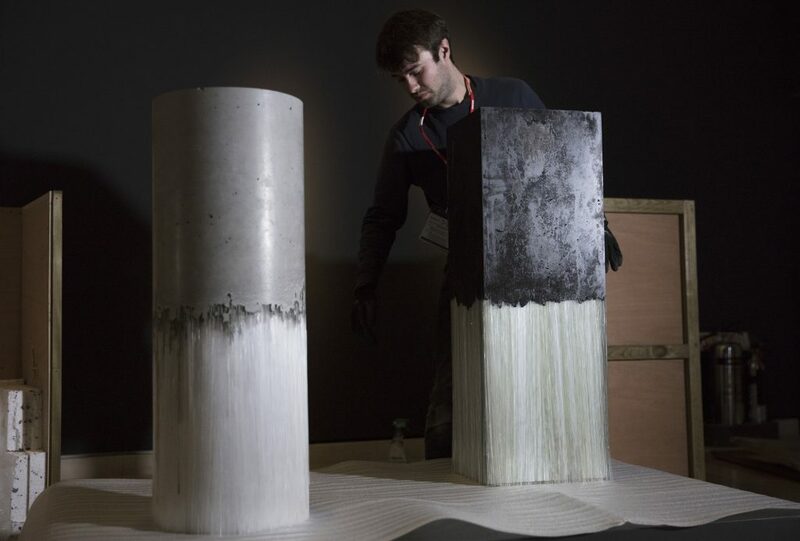 His work is celebrated for its unusual marrying of materials and experimental approach to the traditional process. Drawn to the traditional Venetian glass technique of murrine, he draws stringers of glass that would traditionally be cast together to create canes with an internal pattern, that would then be sliced into tiles. Here he isolates them, keeping them as a string form, highlighting their fragility to further the tension in the work. You are left both mesmerised and perplexed as to how the sculptures stand. I really admire Harry’s commitment to his art, challenging himself and his craft to be able to scale up the work to create his largest pieces to date for the exhibition. He is still very young and has achieved so much since he graduated, he is definitely one to watch. 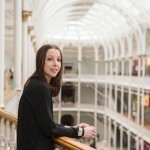 Karlyn Sutherland in conversation with Sarah Rothwell, Curator, Modern & Contemporary Design, National Museums Scotland. Another emerging artist based within Scotland is Karlyn Sutherland. Hailing from Lybster, in the north of Scotland, Karlyn grew up surrounded by artists who would be in residence each year at the internationally renowned Northland Creative. 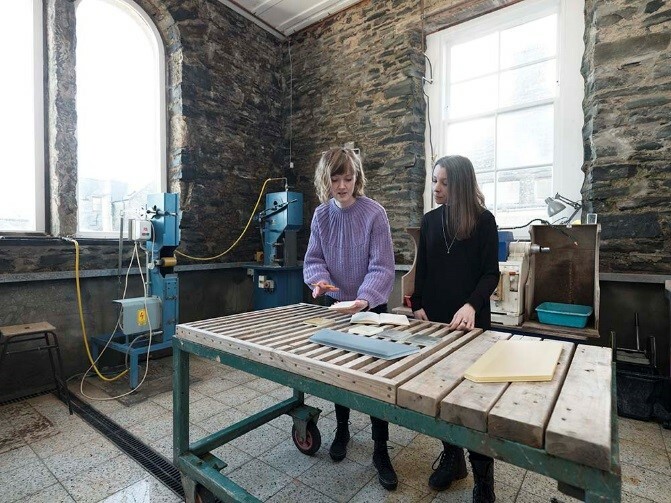 Initially studying architecture, Karlyn was drawn to glass after returning to Lybster as part of her PhD research on the emotional impact of place on an individual. It was here, after attending a masterclass with the glass artists Jane Bruce and Bruno Romanelli, that she was first drawn to glass as an artistic medium. Lybster is a small former herring port on the northeast coast of Scotland and has a wonderful quality of light. When we visited last spring we could easily see why Karlyn was drawn home to investigate why so many artists have been drawn there over the years and how the location has had such an impact upon their artistic practice. 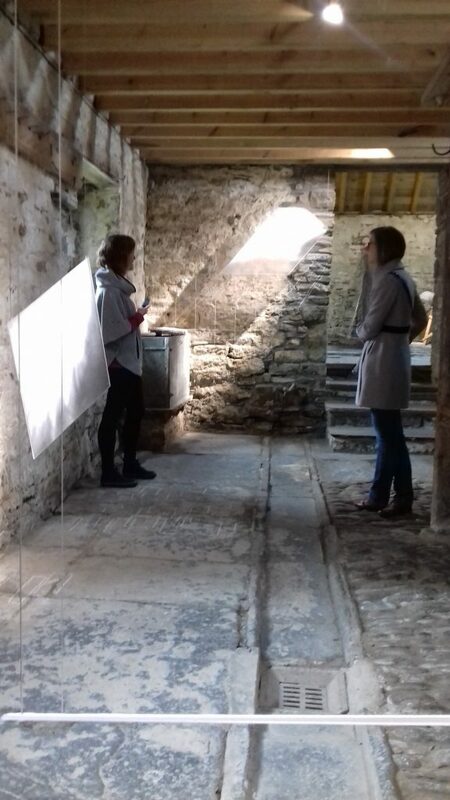 Karlyn Sutherland discussing her installation with Bryony Windsor, Head of Exhibitions, NCCD. © Sarah Rothwell. Karlyn has become known for her evocative sculptures, fused wall pieces and site-specific installations that explore light and shadow. 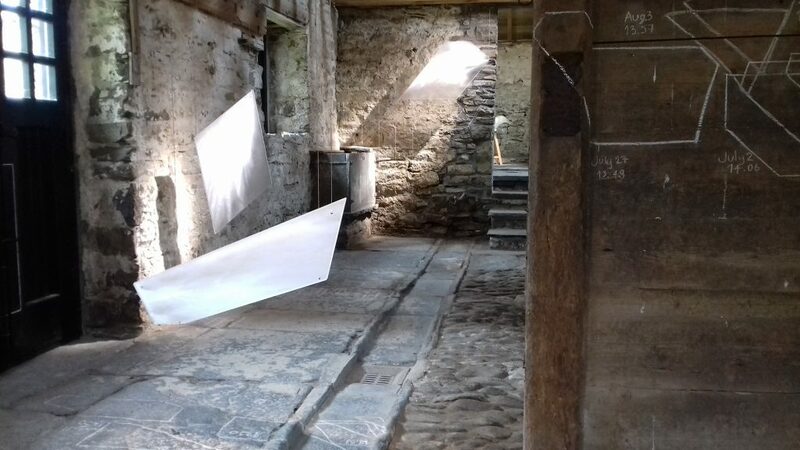 During our visit, Karlyn very kindly took us to view some of her new work in development, as well as her beautiful installation Byre, Latheron House: Tracing Light. The work charts the progression of light as it traversed through the building. These transient moments are captured between line drawings and hung kiln formed panels of glass that refract the light, encapsulating an ethereal moment in time. In 2016, she was an Endeavor Research Fellow in the Glass Workshop of the Australian National University in Canberra, as well as artist-in-residence at Bullseye Studio in Portland, Oregon and at the Corning Museum of Glass in New York the following year. Notably, she was the 2017 recipient of the 32nd Rakow Commission by the Corning Museum of Glass; the award recognised her as an ‘emerging artist who is creating critically-engaged, highly-refined glass works that expand our understanding of the material’. Karlyn’s work is steeped in the emotional connection she has to her environment, as well as her dedication to further understanding her medium and how it can encapsulate the transient colours she is striving to capture. She is now gaining an international reputation and critical acclaim for her work, and we can’t wait to see what she develops next. Geoffrey Mann in conversation with Sarah Rothwell, Curator, Modern & Contemporary Design, National Museums Scotland. The last Scottish artist we visited was the artist and Programme Director at Edinburgh College of Art, Geoffrey Mann. Geoffrey’s creative practice stretches the limits of his chosen medium, embracing new technologies in the creative design, process and production of his work and was one of the first within the UK to embrace digital technology in line with his craft skills. Inspired by his fascination with transposing the ephemeral nature of time and motion, he captures, and documents social interactions and histories associated to a place, often visualising these through objects associated with domesticity. His work is often two part; a digital animation that explores either sound or movement creating a living object, and a tangible artefact which captures a moment caught in time. 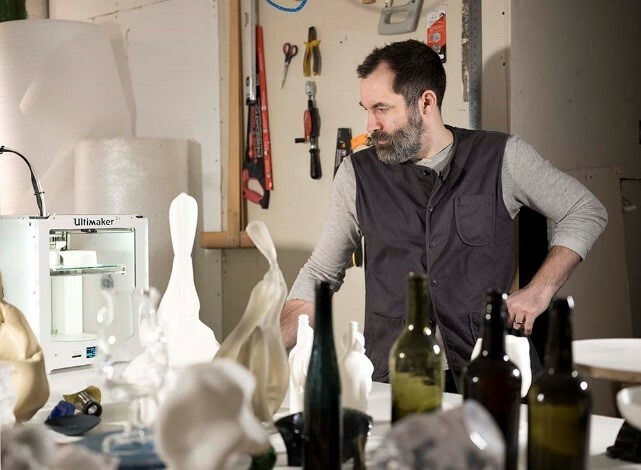 Both exhibited and collected internationally, Geoffrey was awarded the World Craft Council Prize for Glass in 2008 and in 2009 won the Jerwood Contemporary Makers Prize. Initially, we had approached Geoffrey during our peer review process to discuss the project and also those artists who had emerged from ECA that we should consider. 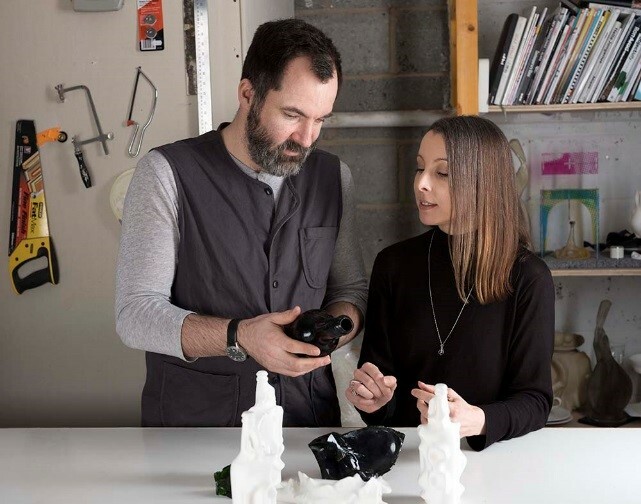 Whilst we were there we stated we would like to include him too as we are both great admirers of his practice, as one of the leading glass artist’s working with digital technology. Geoffrey Mann in his studio, Leith, 2018. Luckily Geoffrey agreed, and following a visit to his studio where we chatted about a research project on the urban myth around the Leith Pattern wine bottle he was developing, we discussed the possibility of this work being included in the show. A fascinating subject that I had not come across, so I was happy to put Geoffrey in touch with the local glass historian Jill Turnbull, and the subject developed from there to the artwork you can now view within the exhibition. Listen here to the artists speaking about their practice and the works they created for the exhibition. The Art of Glass exhibition is on at the National Museum of Scotland until 16 September 2018 and follows two years of research and development funded by Art Fund Jonathan Ruffer Curatorial Award.